Fickle winter. It teases us with cold weather but fails to deliver on the snow. It wreaks havoc with my motivation and my love of the outdoors. My identity as a cross-country skier is in shambles. For weeks I have been unable to get excited about skiing. I can’t drag myself across the street to ski on trails that are barely covered, and I convince myself that I’d rather go running anyway. Despite slipping and sliding on the icy or snow-clogged Lakewalk, I take refuge in the familiar. I just can’t get over the hurdle to embrace skiing instead. But the recent snowfall engineered a shift. It actually looks and feels like winter. Distant memories return. Suddenly I feel the draw of the trails. The pull of a new blanket of snow. The sun filtering through the trees and glinting off the soft white powder. The crisp air brushing my cheeks. It is mine for the taking. This time I can’t help but answer the call. On my first foray into the woods I discover that I beat the groomer to the trails. Instead of crisp firm corduroy, I find soft untouched snow with a packed base not far beneath. All sounds are muffled by this new fallen splendor. The hush quiets my mind as the powder slows my skis. I am moving in slow motion, but it makes no difference. For once it’s not about the pace, it is all about the experience. Day two and I’m eager to return. The groomer has worked its magic in my absence. I am early enough to enjoy some virgin terrain, cutting my own diagonal slices through the sculpted surface. The tall pines still wear their mantle of white and the forest floor is a series of soft undulating mounds pocked with occasional animal tracks. Whether real or imagined, the air feels fresher than ever. I knew there was a reason I loved winter, I’d just forgotten what it was. I’m glad to be out gliding again. 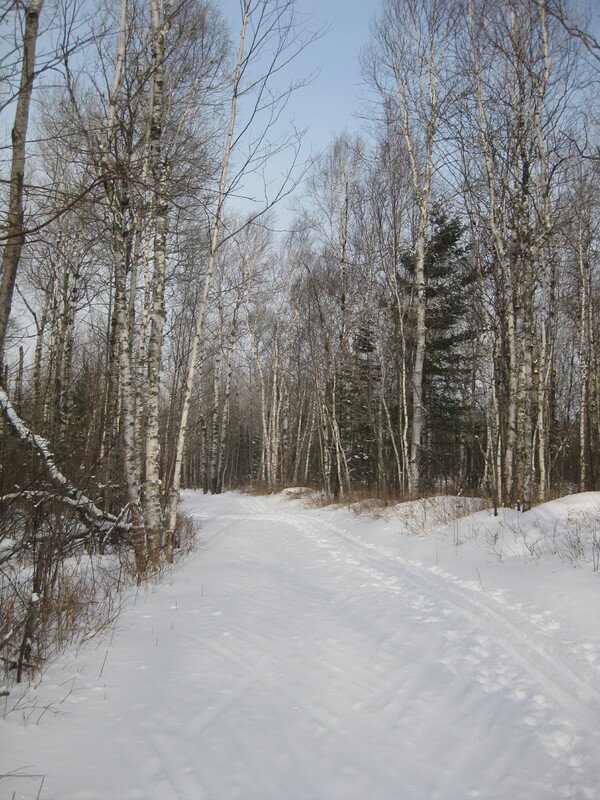 This entry was posted in Keeping Fit, Outdoors and tagged Cross-Country Skiing, Snow, Winter by Molly. Bookmark the permalink.